Hundreds of Kenyan girls are preparing to spend Christmas in schools, rather than with their families, fearing that their parents will force them to undergo female genital mutilation (FGM). 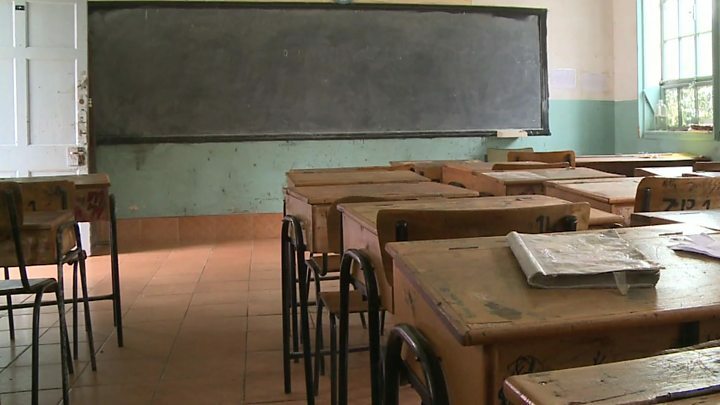 Schools that should have closed more than a month ago for the holidays are staying open for the girls, while others are staying in churches in north-western Pokot County. "My parents force us to undergo FGM because they want dowry. When girls are circumcised, their parents have already arranged for them to be married off. "When they finish the initiation, their parents introduce them to their husband, whose family gives them cows as dowry," she tells the BBC. Despite the introduction of stiff penalties for offenders after FGM was made illegal in 2011, the practice continues in many parts of Kenya. Girls are most at risk during the December holidays, traditionally a time for initiation rites for both boys and girls. Headteachers have been told to accommodate the girls and to ensure they attend classes throughout the year, to prevent them being married off at a very young age or forced to undergo FGM in secret. One in five women in Kenya between the ages of 15 and 49 is circumcised, according to government figures. There is also a worrying trend towards younger and younger girls being forced to undergo the procedure. Of women in their early 20s who were circumcised, around a quarter of them said they underwent the procedure when they were between five and nine years old, according to a recent report from the country's bureau of statistics. At Saint Catherine Chepnyal Girls School, students have been taking part in a campaign against the practice, singing songs urging their parents to stop FGM and let them live their own lives freely. Mary Jepkemoi, who is set to join secondary school next year, says most of her contemporaries who have undergone circumcision are now married. "You pity them. They have children and they themselves are children. When you ask them why, they answer you: 'What do I do? There is no-one to pay school fees for me.' They need help too. "Were it not that I love these seminars, I would also be at home. I will never undergo FGM," she adds. The girls who have run away from home are being supported by many members of the local community, who have embraced the anti-FGM campaign. A sensitisation event was also held recently at the nearby Sook Boys Secondary School. Girls, boys and even some parents came together and marched in solidarity with those who had run away. 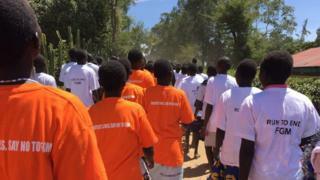 They were wearing shirts of various colours denoting the villages they come from, each one bearing the message: "Stop, run away from FGM". Caroline, one of the girls who took part in the event, says most of her friends have been forced by their parents to drop out of school, and some will be married off. "I have learned how to protect myself once I go back to the village. I know where to report when I am threatened. I will also sensitise others," she says. But activist Selina Kipkerker says that since the ban on FGM and the intensification of campaigns against it, the practice has not stopped, but been driven underground. "The many girls who have run away from home because they have been forced to undergo circumcision, but we urge them when they are forced they should report to the local chief," she says. "There are some churches here which encourage their followers to circumcise their girls but things are changing, so nowadays they do it secretly." There are many who believe that circumcision is required by religion and also expected from those within their own communities. Local county commissioner Brian Njeru admits it will take years for the practice to be eradicated and girls will continue to be vulnerable. "This is a deeply entrenched issue that will take time to completely get rid of. "These days there are no elaborate ceremonies to celebrate girls who have undergone FGM. "It is very secretive and it makes it very difficult to apprehend those who are behind this." Mr Njeru has turned all the girls' schools in his division into rescue centres. He says the number of girls enrolling in both primary and secondary schools has increased sharply since the ban on FGM came into force five years ago. "Most of the girls now aren't going to undergo FGM. Instead they come for training," says Gladys Andiema, the headmistress of Saint Catherine Chepnyal Girls School. Loise Chesista, one of the beneficiaries of training sessions offered at Chepnyal, says she has gained lots of skills from the school. "We have many friends who would have wanted to be in schools but their parents cannot afford [it]. I believe, with help, most of them can study and excel," she says. The names of some of the girls interviewed for this article have been changed to protect their identities.